In the last year or so, I’ve tried to give up my compulsive desire to read AS MANY BOOKS AS POSSIBLE and instead get as much from my reading experiences as I can. Which means that when new books of series I like come out, I’ve often returned to the previous books so that when I read the new one, everything is sharp and crisp in my mind. I did this in 2011 for the Shiver series and also for the Summer I Turned Pretty series. And when Bitterblue arrived on my doorstep, I dove right in and I also checked out the audio copies of Fire and Graceling from the library and listened to them at the same time. I’m glad I did, too, because there was SO much of the stories that I’d forgotten, particularly Fire. Also, this was one of those books where I really felt like my reading of Bitterblue suffered a little because I couldn’t remember so much of what happened in the first two books. I’m curious to see what the response to Bitterblue is like – I know it’s been eagerly anticipated, but it wasn’t really at all what I expected. It didn’t have the action and high intensity that Graceling and Fire had. Rather than being an adventure story, I felt like this was very much a political drama. 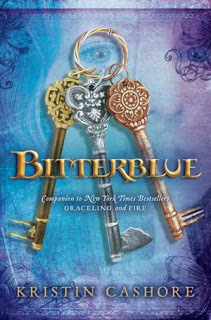 This book follows Bitterblue, the eighteen-year-old queen of Monsea, (You’ll remember she was rescued by Po and Katsa back at the end of Graceling and then became queen when Katsa killed Bitterblue’s father, Leck). She’s doing her best to rule the kingdom, but she’s still young and much of the day-to-day stuff is handled by advisers. Also, she begins to realize that her father’s grace of deception still hangs over the kingdom and she wants to get to the bottom of it. Of course, as is so often the case, the more she digs, the more she realizes she doesn’t know. She has fragmented memories of her father and her mother, but she can’t get anyone to talk much about what went on in the kingdom under Leck’s rule, and the more she pokes around, the more questions she has. What was Leck doing with all those animals he was torturing? And the little girls that kept going missing? Why is the castle built the way it is? And what was the point of these ridiculously massive bridges? Suddenly, Bitterblue is obsessed with finding out more. (One of the things I mentioned in my review of Fire was that I was amazed by Kristin Cashore’s skill in setting up plotlines that I didn’t see coming at all, but then, in hindsight seemed so obvious. This was the case for me in Bitterblue as well. I hadn’t even considered that there might be a reason for Leck’s torture and evil. I just assumed it was because he was evil). Frustrated by the lack of information within the castle, Bitterblue starts sneaking out at night, where she discovers these storyrooms around the kingdom where various people share stories about all kinds of things (some true, some utterly fantastic), including life under Leck’s rule. She’s fascinated and hopes to learn more, sneaking out more and more often. And then, quite by accident, she falls in with these two young men who appear to be thieves of some sort, but also are very likeable. They don’t really trust her, but it doesn’t seem to bother them. She’s anxious to learn more about them and what they might possibly know about Leck’s reign. When I think about Graceling and Fire, I could explain the story arc quite quickly and simply. Not the case in this book. There will be a moment of action and then everything settles right back down and it’s back to pacing the castle and wondering about what Leck was doing. This book really seemed to go on for an eternity with very little progress being made – the story is spun out very slowly with lots of starts and stops and a bazillion little plotlines. Additionally, though there is a bit of a relationship in this book, it’s not really a very romantic book, which I didn’t particularly notice until I started re-listening to Graceling and Fire, and then Bitterblue stood out in stark contrast to those books. There’s no one to compare with Po or Brigan, that’s for sure. And, I found Katsa quite unlikeable in this book, while my love for Po deepened considerably (watching him maneuver through life with no eyesight and his immensely strong grace was just pleasant. Also, he got many witty lines). I’m anxious to see how other people react to this book – it’s been so eagerly anticipated, but I found that it was very different from what I expected and not really a book I fell in love with. Reading the entire series again also solidified for me that Fire is indeed my very favorite of the series. I truly love that book. This one? Not quite so much. Definitely my least favorite of the three. i adore Fire as well. I really liked Graceling, but I haven't read Fire yet. Time to put my name on the list at the library for both Fire and Bitterblue. I've never gotten into the whole Graceling series. Maybe I should reconsider, even if this book wasn't quite as good. I've heard a lot of good things about it yet I'm hesitant for some reason. I'm so interested to see what I'll think of this one. It's been far too long since I've read Graceling and Fire and I can't remember a thing. I'll have to re-read them before I get to Bitterblue. Ohhhhh, I loved BITTERBLUE way more than I thought I would! I loved GRACELING and had a hard time with all the politics in FIRE, so I wasn't sure what to expect. You're right, the concentration is not on the romance or even the adventure as much as in the first two books. And I will admit that I got all her advisers mixed up, too. But I loved the story of a young queen coming in to her own, realizing that she wasn't in control of her destiny and then doing whatever she could to seize control of it. I guess I feel like there are many YA books about young royalty, but this one really got into what it MEANS to have the responsibility of an entire country and how you deal with that and how you start to pick up the pieces after such a terrible tragedy. I have started reading Fire, but have had a really hard time getting into it. I had to renew it at the Library because it has taken me so long to read it. I'll have to keep trying. Hopefully I can get into it, because I loved Graceling.